The wiki has been archived into a permanent record of iGEM 2015. Other teams' content showing up in your wiki? There is a problem with some team wikis, where content from the wrong team appeared by accident. Please do not edit other teams' wiki pages! Instead, just remove their content from your wiki page, and add your own. If you want to get a "clean copy" of the blank wiki, you may copy from the Example2 wiki. Remember to change "Example2" to your own team name whenever it appears! All iGEM 2015 Team Wikis are required to have the iGEM Login Bar. The Login Bar includes essential links, tools, and information for all users: both wiki creators and viewers. The judges need these tools. Teams are not allowed to hide, disable, or alter the login bar, so please keep this in mind as you design your wiki. This is a new rule for 2015. Please read all about this big change on our new Standard Pages Page. Flash is not permitted on the iGEM 2015 wiki. Adobe flash is 100% proprietary and you cannot view the source like you can with our wiki. We chose wikis for teams to build their projects so the source code would be available for future teams, to build on the concept of open source. Flash can also be hosted on external sites and we want 100% of the content of our wikis to be on our wikis. 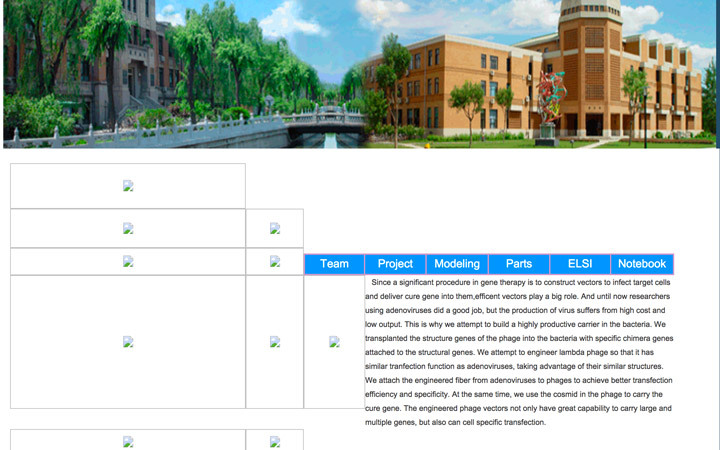 All team pages, images, documents and code must be hosted on the 2015.igem.org server. We preserve all iGEM content on our own servers so future teams can learn from what you have done. When you store content on your own sites or servers, after time, links might become broken, sites might go down, and information will be lost. Additionally, hosting content outside of 2015.iGEM.org allows teams to change/add information to their wiki after the wiki freeze. Please note that altering content after the wiki freeze is a form of cheating. All iGEM 2015 teams are given a namespace on the iGEM 2015 wiki with their team name. Teams are allowed to create and edit pages within their respective team namespace. Teams are not allowed to create or edit pages belonging to another team's namespace. The wiki freeze for the 2015 Giant Jamboree is on September 18, along with other deadlines. iGEM experiences higher than normal traffic on this day which can lead to strain on our servers and sessions timing out for users. iGEM HQ recommends that users do not wait till the last day to work/finish their wikis. Once the wikis are frozen, users can no longer make any changes until they are unfrozen after the Jamboree. The team's project description must be documented on their iGEM Team Wiki by the deadline. The project description should be 1-3 paragraphs and only needs to include an up-to-date explanation of the project. The team's wiki must include an attributions section. Work on your wiki throughout the year and save small edits for last Don't wait to add/edit large portions of wiki content the day of the Wiki Freeze Just before the Wiki Freeze, iGEM websites experience increased traffic and server loads. This can be a difficult time to make larger changes or additions to your wiki. Don't wait till the last minute! Name uploaded files clearly and uniquely (TeamName_Header.png) Don't use generic names for you files (Header.png) Using unique names makes searching/identification of uploaded files easier, and reduces the chance that another team will accidentally overwrite your file with a different one having the same name. Add a wiki page, change a wiki page, delete a wiki page, etc. All iGEM wiki sites are powered by Mediawiki. See the Mediawiki Help page for details on how to edit wiki pages and more. Using/editing the wiki is a trial-and-error process. Editing the wiki is a simple, fun thing to do and you definitely get better the more you play around with it. The key is to take a look at other wiki pages and see what you like. Then all you have to do is go to the source (either view source if you're not logged in, or edit if you are logged in), copy it, and modify it to fit your needs. It doesn't have to be perfect before you can take a look at what it looks like. Try things out and see what results they yield. Adding a page to your team's namespace? Specifically, when you create a new page, you just have to name it Team:OFFICIAL team name/PageName. For example, if you were on Team Example and wanted to create a Biosensor project page you would name it Team:Example/Biosensor_project. For more information, visit the MathJax documentation. Take a look at a few 2013 team wikis to see how other teams setup the styling. You can do this by going to a wiki, and looking for view source in the default wiki links at the top of the page. See MIT's and TU-Munich's for examples. You can upload videos (ogg, mp4, webm) to the 2015 wiki by using Mediawiki's Upload tool. You can display videos by using the HTML 5 <video> tag, along with <source src="file_url" type="video/ogg" />. Take a look at the 2013 Leed's team wiki to see how they displayed their video. You can do this by going to their wiki, and looking for view source in the default wiki links at the top of the page. This year, we are requiring that information pertinent to specific prizes must appear on specific, static URLs on your wiki. Dynamically generated pages may not be understood correctly by the Judging Form. Please review the Wiki Standard Pages requirements, and perhaps test your pages on the Judging Form to see if they are understood correctly. If they are not, you risk that the judges may not evaluate those parts of your wiki. I was also part of an iGEM team! In 2011 and 2012 my role was to design and create our team’s wiki. So wiki freeze was my major deadline. I am by no means an expert but let me share with you some of the things I learned with two wiki freezes under my belt. 1. Test your webpage layout: is information easy to find? I made the terrible mistake of not asking for a third party’s opinion about the layout of information on our site. It was obvious for me how things were laid out and organized. It wasn’t for the people evaluating us. 2. Look at other teams’ code, see how they documented and what resources they used. It is always good to get inspiration from other iGEM teams. See what you liked that they did and strive to improve! 3. Start working on your documentation early on. This was a good thing that we did; we created a common file that more than one person can edit at a time. Divide the documentation into smaller files and assign a team member to fully document that topic. In the end you will have a printable version of your project that you can share as a pdf file with other people! 4. Name your images according to the project and keep them all in a folder on your computer. Sometimes naming your gel image “gelthingy_whyiamworkingat3am” sounds perfect at 3AM but later it may not be easy to know what or when that photograph was taken or that image created. Also, the iGEM database doesn’t know that you created that file so if someone names their file with the same name it can end up being replaced! Avoid using generic names like “banner.png” or “logo.jpg”. 5. Do not leave everything to the last minute! Plan ahead. The last thing you want to be doing at 11:30PM the night of wiki freeze is uploading images. It is very stressful to be looking at the clock and hoping some kind of coding miracle helps you fix bugs faster. Plan to have everything online at least one week ahead so you can go enjoy a nice dinner with your team that night! I hope this helps and if you have any questions, feel free to email me or send me a tweet!